Its a nearly perfect night at the Seasoned Rookies Global Headquarters. My $13 eBay laptop is charged and chugging along nicely as I sit on a blanket in the yard. Miss Brandys garden is blooming nicely and the Swing time Hour is wafting from the old electric radio on the garage shelf. Ive even found a companion to join me in the garage a tabby named well, she doesnt have a name, so I just call her Cat. Shes about to have kittens any day now, and showing nothing but good taste has set up her nesting area under my Zuki Trailer out back So as my mentor Ranger Rick would say, Life is good. 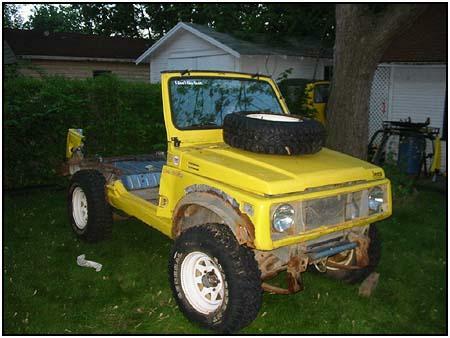 Two months ago I wrote an article outlining some plans I had to refurbish and preserve my yellow Samurai. 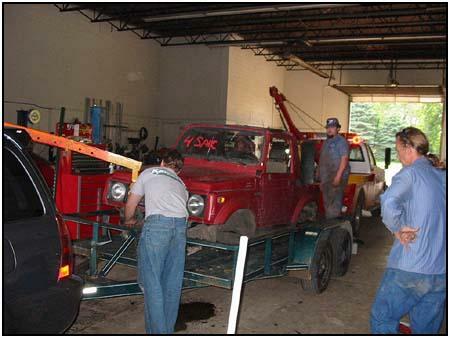 Im sure many of you are now aware that the Suzuki Samurai was Japans way of smuggling rust into the USA. As many of my fellow rookies know, my imagination can sometimes get the best of me and delusions of grandeur oftentimes take over what was once a rational-minded individual. 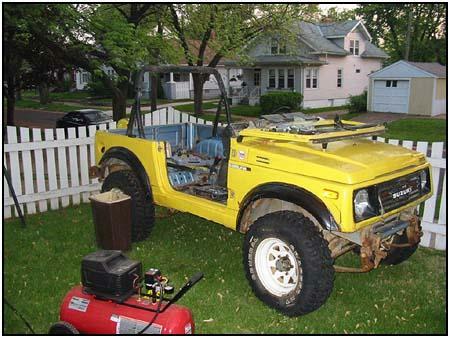 One weekend I drove the Tonka Toy into the backyard and started the long process of removing carpeting, seats, unbolting, unscrewing and brought the body to a basic empty shell. What I found was overwhelming and discouraging Holes that I could stick my hand through. 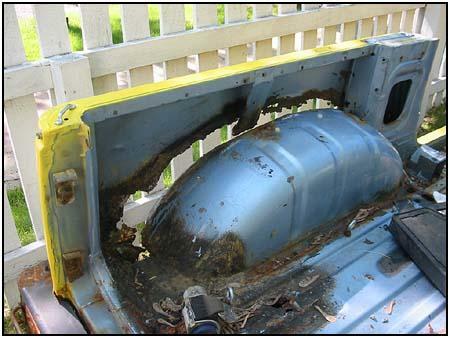 Body mounts completely rusted away. One fender well completely seperated from the tub. 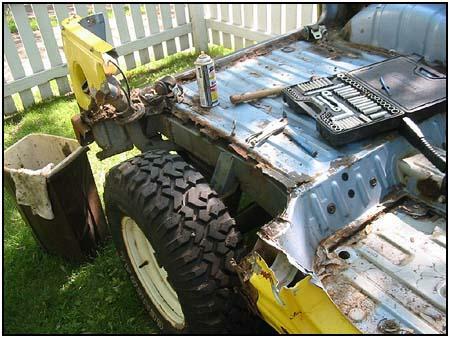 I knew there was SOME rust in there but couldnt we pop-rivet or braze new metal in there? Phone calls were made to the man who never believes in giving up my good friend Louie, otherwise known as Billy Bob. Louie explained that for safety reasons, this body would not be suitable for what we intended to use it for. With nearly half of the body mounts rotted away, an ailing body, as well as some other discoveries, it seemed that my beloved truck had indeed served me well, and ran last years ZookiMelt on borrowed time. I still insisted there are so many good parts a decent engine, a BDS lift kit from North Coast Offroad, recently rebuilt front knuckles, and much more so a compromise was suggested: Why not give a call to Rods Samurai Parts (link) and see what he has I bet he has a good body sitting around for a decent price swap your good stuff onto that and youre in business! Before even undoing bolt number one, I realized that I wanted to take some sort of special method precautions with this project, and I urge you to do the same in your repair adventures: All scrap and garbage will be sorted and recycled if possible. Any fluids drained will be handled appropriately Take every reasonable opportunity to improve or repair exposed parts for reasons of convenience. One week ago the adventure began. Danger Dad graciously offered me the use of his new Toyota 4Runner while he was out of town. Armed with a trailer borrowed from Bill Airzuk Maulding and his Beanco pals, I was off to Marshalltown, Iowa to find me a Zuki! I pulled into Rods shop where the body was waiting for me on some sort of crane apparatus a little dirty with an odd musty smell in the inside, and a dented hood and tailgate aside from that, it was just what the Zuki Doctor ordered. Using that crane apparatus and the help of Rods staff, the body was lowered gingerly and securely strapped down on the trailer and I made my way back down I-80 towards Peoria. 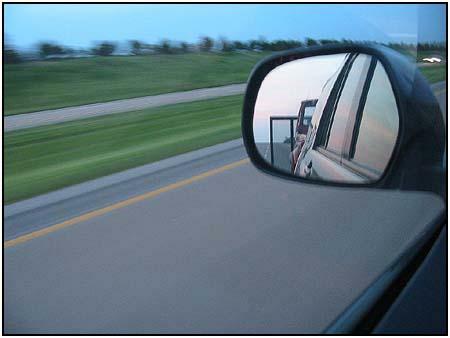 For five more hours I cruised along -- the big Toyota V-8 humming along flawlessly as if it knew what precious cargo was in tow. I reflected on the amazing luck I had with how easy it was to load the body onto the trailer and just how was I going to get this thing off the trailer and into the garage? Multiple scenarios flew through my head, and all of them were stupid. I think the crowd-pleaser favorite was to chain the truck to the tree in my backyard and drive the trailer out from under it, much like a zealous dinner host might do with a tablecloth at a fully set dinner. My rescue came in the form of two large dollies from Harbor Freight. After a slow and steady lifting, the dollies slid right under the frame rails and I slid the body down the ramp and into the garage Cat even looked up from her nap and gave me some looks of disinterested amusement, then went back to dreaming about a can of tuna or something. The last week has been spent unbolting, unscrewing, cleaning and pitching years of nameless stuff from the interior of the truck lots of caked on layers of grime and mud but no rust! The previous owner installed some sort of strange (read: insanely unsafe) body lift on the front two mounts only leaving the rear end of the tub to hover above the frame and cause slight but repairable damage to some of the middle mounts. Upon removing the windshield a lot of fried wires awaited my curious fingers hopefully new ones will be spliced in easily. The front clip needs some minor repair just below the grille some quick welding and my bodywork skills should remedy this with no problem. Next month will be a busy one. Im expecting a box any day now from Figmo at Roadless Gear a polyshield windscreen, a spray-in bedliner kit (much like Rhinoliner but better) as well as some other things. Expect some how-to articles in the coming months transmission and transfer case, and pinion seal replacement, photos of the inner darkness of the mess which is your dashboard, and a potentially amusing section showing your favorite Rookie spraying in the bedliner and several coats of bright yellow paint. Murph, The Seasoned Rookie Life is Good. **Want to keep an eye on Murph as he muddles through this project? Log in to Yahoo Messenger and view the webcam for kcmurphy72 -- If he's working, the cam will be on. Regularly scheduled shows are most evenings after 6pm central, and most Saturdays and Sundays all day weather permitting.